Creating homes and buildings from a material that grows from the Earth is one of the most resourceful ways we can lower our carbon footprint now and in the future. Timber has an established supply chain that has great potential for growth, helping the UK to meet employment, economic and housing targets. That’s alongside working hard to lower carbon and climate-change objectives. Timber is one of the safest and cheapest forms of carbon capture and storage available. Roughly 90% of timber used in the UK comes from certified sustainable sources such as FSC and PEFC, and the rest comes from well-managed sources non-certified forests. Trees naturally absorb carbon when they grow and even when the tree is harvested the carbon remains stored in the timber until the end of its physical life. That is roughly one tonne of carbon per metre cubed. While this carbon is safely trapped inside this timber, for the rest of its life, more trees are planted. In turn, these new trees do the same thing; absorbing carbon and locking it inside, lowering the dangers to the planet. 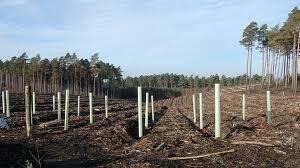 By using more timber, we are encouraging more trees to be planted and therefore helping to lower the amount of carbon in the atmosphere. Wood is a sustainable resource that is both timeless and diverse. We believe that we should be using more of it.